If you have lived in La Jolla for any significant amount of time, you’re likely aware that there are very few storage facilities actually in La Jolla. To be more precise, there are none in zip code 92037. 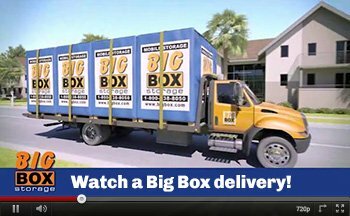 However, as thousands of La Jolla residents have already experienced, Big Box Storage can actually deliver a storage unit directly to your home or business address. Once delivered, simply pack the storage unit at your convenience and it’ll then be picked up for secure storing with the company’s nearby storage which is located approximately three miles east of the UCSD campus. Accessing your storage is quite easy as the company is open every day of the week. Once you determine that the storage rental period is over and storage is no longer needed, simply call Big Box Storage at 858-790-8580 and have your Big Box(es) redelivered to your La Jolla location. If you’re moving beyond La Jolla, it can also be re-delivered to you anywhere else in San Diego County or even the entire United States. For more details on long-distance shipping, please visit the shipping overview. 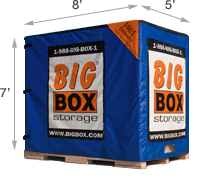 Offering rental rates on storage units that are backed with a low price guarantee, Big Box Storage provides rates as low as $64 per month. Storage delivery and pickup is provided free of charge based on a min. storage term of three months. Each Big Box is 7 feet tall and measures 8 feet long by 5 feet wide. You’ll be able to fit approximately one to one and a half rooms of furniture in each Big Box, although multiple ones can be delivered if additional space is desired. Please visit the storage space estimator for a quick reference on just how many Big Boxes you might need. Whether you live near La Jolla Shores, Birdrock, Muirlands, Mount Soledad, Big Box Storage can deliver a storage unit right to you. The company also offers services across the county including storage in San Diego as well as storage in Coronado. To schedule a delivery and pickup, please use the online scheduling form or contact a company representative at 858-790-8580.